Rainbow flags flew at both Bootle and Southport Town Halls on Thursday (May 17) to mark the International Day Against Homophobia, Biphobia and Transphobia. The day was made even more special by Sefton Council becoming the first local authority to receive the Merseyside and Cheshire Navajo Charter Mark, at the annual Navajo Awards. The Council was recognised for displaying good practice, commitment and knowledge of the specific needs and barriers faced by Sefton’s LGBT+ community. International Day Against Homophobia, Biphobia and Transphobia (IDAHOBIT) celebrates the anniversary of when the World Health Organisation finally removed homosexuality from its official list of mental disorders in 1990. 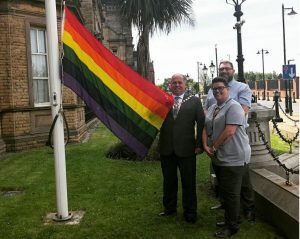 Mayor of Sefton, Cllr Dave Robinson, said: “It is incredibly important to show our continued support to IDAHOBIT and show that Sefton Council supports the LGBT community. “The Rainbow Flag represents the diversity of the community, many of whom are residents across our beautiful borough. Sue Logie, one of Sefton Council’s Youth Workers, said: “IDADHOBIT marks not only the historic moment the World Health Organisation declassified Homosexuality as a mental illness, but the fact that the world was attempting to be more inclusive and accepting. “However this is not always the case and even in 2018 we are still a marginalised group. “I am proud to be part of a team at Sefton Council who have worked hard to achieve the Navajo Charter Mark and will continue to improve the way we support our LGBT+ residents of all ages. For more information about IDAHOBIT visit www.dayagainsthomophobia.org.